As the climate warms, algal blooms of certain harmful species are presenting an increasing threat to many biotic communities. Their introduction is often anthropogenic, and their occurrence is driven by eutrophication and changing climates. Their range may be influenced by rising temperatures, altered salinity due to runoff caused by climate change, and increasing nutrient loads due to increased development and fertilizer use containing favorable levels of nitrogen and phosphorous. Glibert et al. (2014) used a model incorporating climatic changes to predict the future distribution of these harmful algal blooms (HABs) under climate change scenarios. The study found a general increase in the distribution and presence of these HABs, though effects varied by region. As these blooms constitute a global issue, the study looked at areas around the world including the Northwest European Shelf-Baltic Sea system, Northeast Asia, and Southeast Asia, with each system representing varying levels of development. The authors focused their efforts on two pelagic dinoflagellate species groups, Prorocentrum spp. and Karenia spp. These species have a global distribution, are generally the most harmful of the HABs, and have well-studies physiologies. Prorocentrum spp. generally have smaller cells, bloom rapidly in near-shore environments, and are destructive to food webs. Karenia spp. on the other hand are generally larger, bloom slowly in offshore environments, and are toxic with impacts on both human and wildlife health. These two groups are the most prevalent of the HABs, and are thus useful in projecting global changes of these systems. The model used by this study is the Global Coastal Ocean Modelling System, which incorporated projections of sea surface temperature, sea surface salinity, and average nutrient concentration to predict the future distribution of HABs. Nutrient concentrations included the two ratios of NH4+:NO3− and inorganic N : P, both of which influence the presence and success of algal blooms. The model was successful in replicating current conditions, indicating high fidelity. Projections showed variable outcomes by regions. In Northern Europe the number of months conducive to blooms was projected to expand, with a greater increase for Prorocentrum spp. than Karenia spp. In Northeast Asia we may see a small geographic increase of range, with a potential reduction of presence where the HABs are currently located. Southeast Asia might see little to no change for the range of Prorocentrum spp., with a contraction of the range of Karenia spp. These reductions may be due to the temperature range exceeding what is suitable for the growth of HABs. These changes are due mostly to factors of temperature, as the model was built around changes caused by climatic factors. These projections indicate shifts in vulnerability of coastal systems to HABs as well as increased environmental impacts. This is made more important by the fact that the model likely underestimates potential effects, using conservative estimates of temperature while excluding anthropogenic sources of chemical adjustment so as to focus solely on the effects of climate change. Eutrophication is however projected to increase in future years due to increases in agriculture and industry, which could lead to increased toxicity and the further growth and spread of these algal species. The effects of these harmful algal blooms is thus quite likely to increase in the future; hopefully models such as this can help with managing this growing problem. Glibert, P. M., Icarus Allen, J., Artioli, Y., Beusen, A., et al., 2014. Vulnerability of coastal ecosystems to changes in harmful algal bloom distribution in response to climate change: projections based on model analysis. Global change biology, 20, 3845-3858. This entry was posted in Kyle Jensen, Ocean Fertilization, Ocean Warming and tagged Arthur Beusen, Climate change, GCOMS-POLCOMS-ERSIM model, global warming, HABs, harmful algal blooms, IPCC scenarios, J. Icarus Allen, James Harle, Jason Holt., Karenia spp, Lex Bouwman, nutrient stoichiometry, Patricia M. Glibert, Prorocentrum spp, Robert Holmes, Yuri Artioli by Emil Morhardt. Bookmark the permalink. Algal Blooms are due to increase in nutrient input into waterways and are not directly linked to climate change. 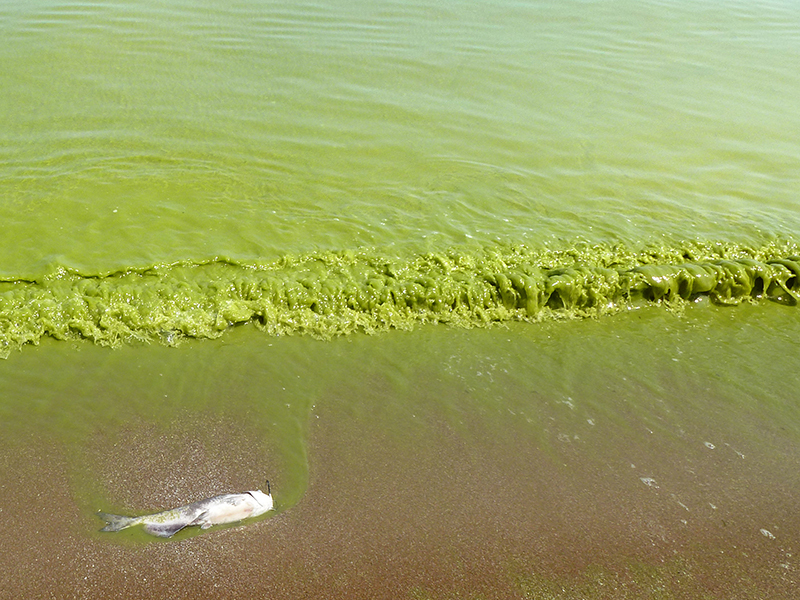 Cyanobacteria blooms in summer were noted even in 1960s. One solution is to grow Diatom Algae even in summer, this will prevent cyano blooms and since Diatoms are the natural food for fish, the food chain in the waterways is strengthened.